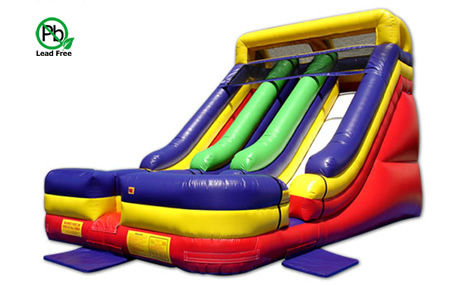 The Backyard Slide will provide hours of fun at your next indoor or outdoor party. The Backyard Slide has an ample jumping area, along with a two lane climb and slide feature. The slide has a celebration theme, complete with confetti-filled art panels, as well as a bright and colorful blue and red design. Parents and spectators will love the 360˚ mesh windows which allow for a clear view of the fun at all times. Kids will love climbing up to the top, then sliding down the fast slide, ending with a splash into the cushioned shallow pool below. 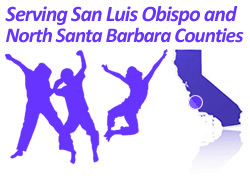 Children will love the excitement of the Summer Splash and parents will love its safety features. 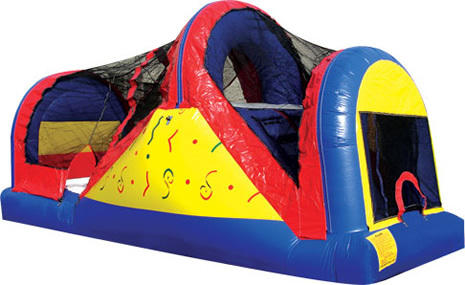 At the top of the 14′ slide is a mesh area that ensures kids slide down it in a safe manner. The bright blue, red and yellow coloring will surely help to promote fun at your next party or celebration. 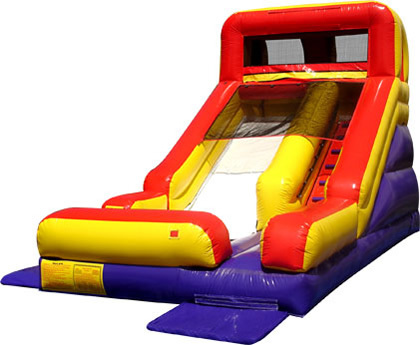 The impressive Double Lane slide is a dual dry slide guaranteed to add tons of excitement and acceleration to any indoor or outdoor event. Great for promoting friendly competition or group challenges, kids can climb together up the center climb, and then choose a left- or right-sided slick slide, for a fast-track ride to the cushioned bottom with a safety stop. Hooded safety on top makes sure riders slide down properly. 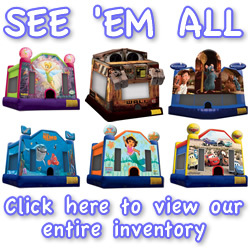 The bright and colorful red-purple-yellow-green theme fits into any décor, sure to attract customers for a thrill-filling day, and keep the kids sliding!